I was invited along with other senior dancers to present traditional Varnams as part of the Spanda anniversary in July 2105 in Chennai, curated by Leela Samson.... (What an idea ! Her FB page had numerous compliments). It was an event to highlight the core ideas of the traditional Varnam, particularly those of the Tanjore Quartet. I understood what she meant when she announced it was a seminar. So, one had to speak? Share one’s understanding of this magnificent piece in the Bharatanatyam repertoire? Yes indeed. When Leela came over to invite me to participate in the event, rather spontaneously I said I will take up Dhanike in Todi and Viriboni in Bhairavi. I never think before jumping into such things....quite like when I agreed to write a book on M.S. when the editor at Roli Books asked me. A few days on....the thinking (worrying!) starts. To dance on stage, even if it were just excerpts from a big Varnam, one has to concentrate on multiple aspects. Well, I worked on the Varnams like a jigsaw puzzle and it all came to a crescendo on stage! An appreciative and knowledgeable audience.... getting rare... was inspirational. I told them how the raga Todi inspired me from childhood. During my gurukulam with Guru Ellappa, one fine day, I had driven my non- airconditioned Fiat across a railway gate to his house in West Mambalam. Before he started teaching me, he sang Dhanike, and I felt I was reaping a rich harvest (Pongal time!) of a distinctive, majestic, lyrical, beautiful Pada Varnam in Todi ragam. My guru structured the Varnam perfectly. He always did a double take.....as he was teaching me, he would also be teaching Mr. Nathan, the mridangam vidwan, how to punctuate, accentuate, and cleverly tease the rhythms to counter the footwork of the dancer on his instrument. Crisp korvais (like fresh Grand Sweets potato chips with a dash of ‘perungayam’), in varying rhythm patterns were his forte....the Thrikala korvai to begin with, and then each korvai in different Nadais like Kandam, Thisram, Misram, etc. I recall he even insisted on the adavus being different for each nrtta segment. They were short, sweet, elegant.... but also subtle in complexities, like the "karvai". We also did simple and direct full stops in the Arudhis (no elaborate long winded ones which look like a separate item!). 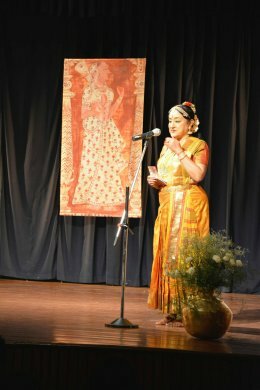 There was a lilting "thattu mettu" gliding all over the stage. My abhinaya for the lyrics are now my own. I demonstrated basic "kai" (gesture for the song) and also that elusive correctness in the sanchari bhava for sringara in a Varnam.....quite different from a ponderous lovelorn woman in a Padam. Of course, in this as in many other varnams, the Sakhi speaks... and how! I always approach the simple lyrics of a Varnam which is not so exotic in poetics, like a lucid Annamayya lyric, or esoteric like a Kshetragna Padam, with dignity of expression. Shringara in this Varnam has a royal context....here the Sakhi addresses the last king Sivaji of the Bhosale dynasty of Tanjavur. In my imagination she would do it with style, aplomb and dignity. A Sakhi is forthright, unabashed and bold. That is why composers thought of songs like "Unnai thoothu anuppinen." These are some interesting situations of shringara. And unless the lyrics as in some Padams, are specifically sensual, there is no need to show Rathi mudras.......hmmmm, got to be careful! Of course, this is my personal sense of aesthetics. I have certain ideas and I play it accordingly. We live today in the age of explicit sensuality thanks to cinema. We dance in a context and space which is different from the boudoir of courtesans. Let us be ourselves and not try to "re-create" a lost ethos which truly does not belong to us. This is my studied opinion. The Nattuvanars have been the guiding light.....and composers like the Tanjore Quartet knew dance and composed accordingly. 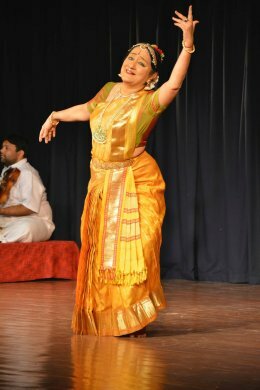 Dhanike is a majestic Varnam, in praise of a king and needs a majestic treatment with all the subtleties of shringara unravelled by the dancer, through glances, gestures and movement. Grace is more than a matter of movement. There is a charm, subtlety and natural beauty in grace. Virtuosity in a Varnam is to strike a proportionate balance between nrtta and abhinaya. With a perfect "kalapramanam" (tempo), a Varnam will not drag and tire the audience. Often when a deity like Shiva is mentioned in a Varnam, many dancers think it is a green signal to dance a series of mythological narratives. The poor singer is stretched to the limit. My gurus never taught me such narratives. Even if there is a reference to an episode in mythology or sthala Puranas, I portray fleeting images putting it all in the right perspective in the context of the Varnam. Dramatic episodes, especially if they mar the overall mood of a Varnam, are to be avoided. And then, singing the correct way. The composers, Tanjore Quartet in particular, were masters of music. Hands on learning from a Nattuvanar known for his musical expertise helped me. To this day, I do not allow all sorts of sangathis and neravals like a Kutcheri in my dance music. My singers know my stand on this. Revisiting the Viriboni Varnam in Bhairavi and ata tala by Pachimiriyam Adi Appayya (the descendants of the Tanjore Quartet say it is Ponnayya's) had its own reward. I think we hit a game finisher six, like Dhoni, with this one being the last of the sessions on Varnams. I had learnt to sing this Varnam when I was a teenager, and knew it well. I was nonplussed when my Guru wanted me to dance this Varnam. When I expressed my doubts, he merely said: "Kacchidhama Seyyalam... Meaning, we can do it correctly...I think he meant he can make the Varnam a great dance piece... and he did so. When I first danced this demanding Varnam, many liked it, and some used to ask me when I would do it again. At the seminar, the musical aspects of Viriboni were briefly discussed. But for me it was the total recall of my Guru's vision of it as dance. We did the quaint sahitya followed by swara and nrtta, etc. The korvais had enough punch to be emphatic. And then the charanam came with simple lyrics. In Ellappa's style there is some spice in the way Thisram is danced in the charanam. My orchestra helped with enough enthusiasm....Bhama Visweswaran (vocal) Rakesh (nattuvanagam), Sudharshini, AND Aniruddh, my friend Sudharani’s son who sparkled with the mridangam. We enjoyed the session as much as the audience did! I hear dancers want to learn these rare pieces. I suggest they form a group of say, 4/6 and approach me! If we dance the classic Varnam in the traditional way, many will not resist this piece de resistance!